If you have never heard Donald Davis tell his stories, then you’ve missed one of the great pleasures of life. His stories of deep curiosity and humor captivate audiences. They are not for children. Nor are they for adults. They are for everyone! No matter the age span in your family (or number of generations), Donald’s stories are an experience that brings recognition, smiles and laughter to all. But they are more than entertaining. Donald’s stories satisfy. They fulfill our need to connect life’s experiences; to connect us to our own memories; to recognize our similarities with others and thereby connect us to our families, to our neighbors, and to our communities. He does this by using his stories as a mirror for us to explore and analyze our own lives. He does this by understanding how the brain works. The brain has capabilities far beyond the one-track mode we usually operate in and I don’t need elaborate scientific studies to prove it. When listening to Donald’s stories I clearly see the antics of Donald convincing his little brother to try walking on the “hard shell” of cow pies; the trying-hard-to-keep-from-smiling face of his father as he assigns proper punishment to Donald for cutting his brother’s curly locks; his mother’s scream as a snake crawls across the dashboard of the car she’s driving, or her stance as she says for the millionth time, “That’s just what mothers do;” or Uncle Frank in his Sunday suit after he’s saved the proceedings of a funeral by removing a skunk from the open grave. But simultaneously I am also seeing my brother and I as six- and seven-year-olds convincing a younger brother to walk under a peach tree with rotten fruit hiding in the tall grass beneath it; my brother not speaking to me all summer after I gave him what most would have thought was a great haircut (I’d been to college and didn’t know he had developed a sensitivity about showing the tops of his ears); my mother cleaning the shower and finding the missing-for-six-months garter snake a brother had brought home from scout camp, and words from my mother I had disliked hearing as a child pass through my lips to my own children; and me in my Sunday clothes running round and round an old Volkswagen van trying to shake a large, smelly, amorous goat until being saved by a neighbor, the goat’s loving owner. I am fully participating in both stories at the same time (Donald’s and mine) while creating a third story, that of the reality of me sitting with family and friends in a performance tent, listening to Donald, and the additional stories we generate as we share that experience. 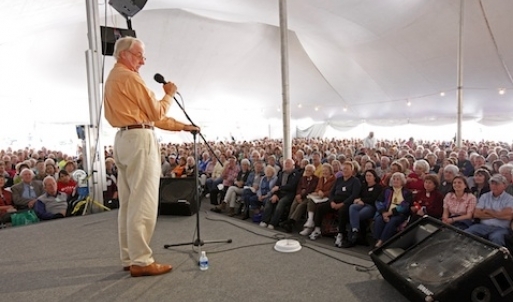 Like his stories, Donald’s storytelling retreats are also about people. And, not surprisingly, it is people who make stories. As Donald puts it, “Stories are the trouble people have and then how they resolve that trouble through their own devices or through the help of others.” Folks just need a bit of help untangling the strands of life to find the beginnings and endings so they can share their stories with their families, their children, and their grandchildren. Then, after a story has been told and told again and you know just what has to be included for listeners to understand it, the story is ready to be written. What a fun way to share and bequeath personal and family history! Grab the opportunity this summer and run, don’t walk, to Donald’s performances at the Timpanogos Storytelling Festival. Or, begin your family history by participating in one of his storytelling retreats. See you there!